Hot on the heels of 2018s Aquaman movie is this online slot themed on our favourite subterranean superhero; it’s developed by Playtech and it offers players several free spin features plus the DC Super Heroes progressive jackpot. Aquaman is a five reel slot with three rows and two hundred and forty three ways to win; cartoon-style graphics are one of the standout design features here and behind the reels there’s a view of Atlantis, to which Aquaman is the heir. The higher value symbols include Aquaman, Mera and four villains all trying to thwart our heros plans; 10, J, Q, K and A represent the lower values. Aquaman’s trident is wild and it will replace all other symbols to help form winning combinations except for the Free Games scatter icon. This triggered by filling up reel two with a stacked Aquaman after which he will fling his trident onto the reels, sticking three adjacent wild symbols in place; the reels will now spin until a win is formed. Trigger this by filling reel four with a stacked Mera symbol – she will now choose one symbol on the reels, lock it in place and respin the reels; any new matching symbols will also lock in place and this will continue until there are no more. The Trident Wild Respins and the Ocean Rush Respins can be triggered on the same spin. 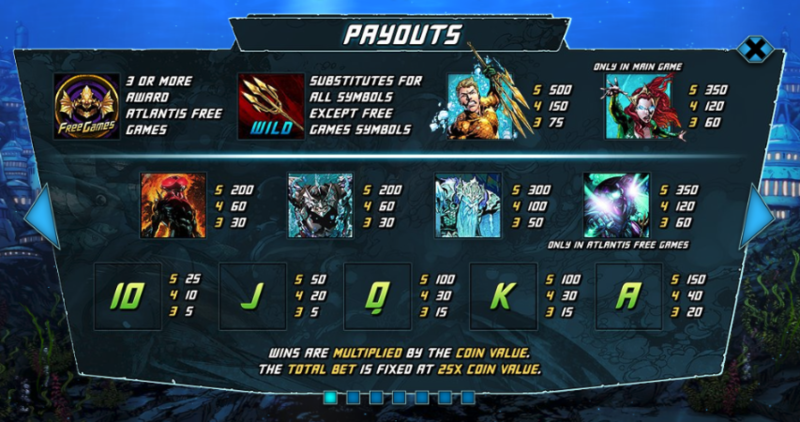 This is triggered by landing three, four or five of the Free Games scatter symbols anywhere in view for which you will receive 8, 12 or 16 free spins respectively; during this round look out for the golden Aquaman symbols because as you collect them they will slowly replace the villain symbols with Aquaman symbols for bigger wins. Four, eight, twelve and sixteen golden Aquamen will replace the baddies in order of value. Landing two, three, four or five Free Games symbols during this round will award an extra 4, 8, 12 or 16 free spins indefinitely. In addition wild symbols can award a multiplier value of 2x, 3x or 4x when part of a win. Aquaman is part of the DC Super Heroes Progressive jackpot and you can see the Grand, Major, Minor and Mini totals above the reels. Entering the jackpot game is a random award after which you’ll get to pick from a honeycomb pattern until you’ve matched the required amount of colours to win one of the prizes. The higher your stake, the better the chance of entering the jackpot game. 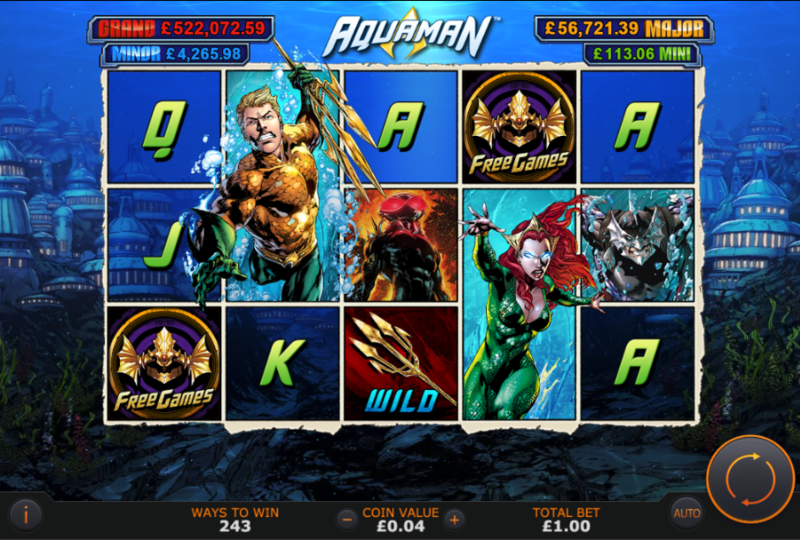 There’s plenty to like about Aquaman and although the design of this slot may look a little dated we’re assuming that’s by design as a tribute to the style of the original comic book; there are lots of extra features here and of course the progressive jackpot to aim for.